Thanks to our committed volunteers, partners, and donors, the construction of the Octagon Barn Center is underway! With the Milking Parlor renovations already complete, we are so close to making this vision of a community gathering place a reality. Please consider making a gift today. Just click on the donate now button and select “barn fund” as your chosen project. With your help, we can throw the Barn doors open this fall. If you or your business are interested in sponsoring a specific part of the Octagon Barn Center, please refer to our list of adoptable projects and contact Development Manager Lauren Meers at lauren@lcslo.org or call (805) 544-9096. What is the Octagon Barn and the Octagon Barn Center? A rare and iconic landmark unique to San Luis Obispo County, The Land Conservancy’s Octagon Barn was on the verge of collapse when The Land Conservancy stepped in to save the building and revitalize the site for community benefit. Today, thanks to many dedicated volunteers and generous donors, The Land Conservancy has restored the historic Octagon Barn itself; however, more work is needed to complete the Octagon Barn Center and open the site for public use. The structural restoration of the Octagon Barn has involved tremendous local support from hundreds of volunteers who donated thousands of hours, and many local businesses have helped with materials and construction expertise. Today, we can proudly say that the century-old Octagon Barn structure has been saved from collapse. 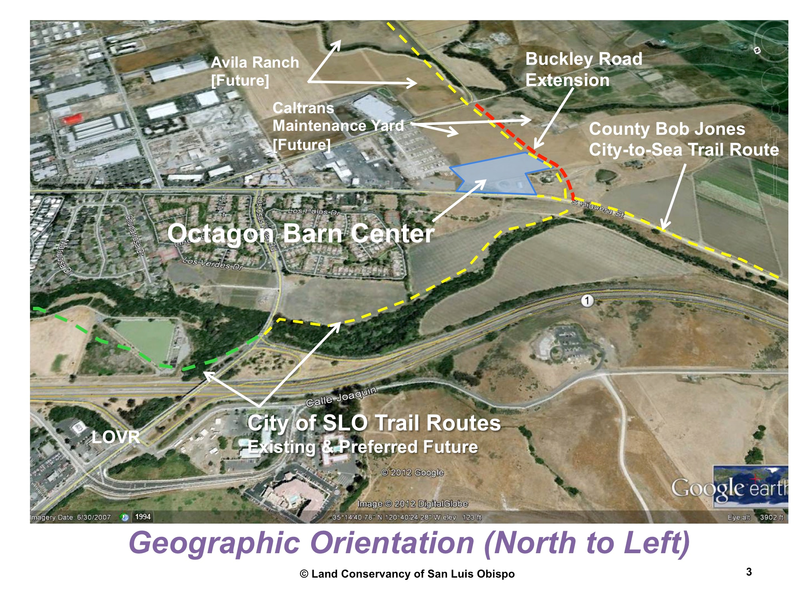 The Octagon Barn and its surrounding buildings, which include the Milking Parlor, Calf Barn, and other structures, which will be known as the Octagon Barn Center, will be a landmark gateway to the City of San Luis Obispo that serves as a community gathering place for recreation, education, conservation, and the arts. Since 1996, The Land Conservancy has led community efforts to lovingly restore the Octagon Barn which is now poised for new activity at the center of SLO County’s life. How Does the Octagon Barn Center Benefit You and Our Community? New trailhead for the Bob Jones City-to-Sea Trail and a hub for three regional bicycle routes. For an image of the bicycle routes, click here. To donate to the Octagon Barn project, click here. Construction is underway to transform the formerly private site into a public amenity with the fully restored Barn as the keystone element. 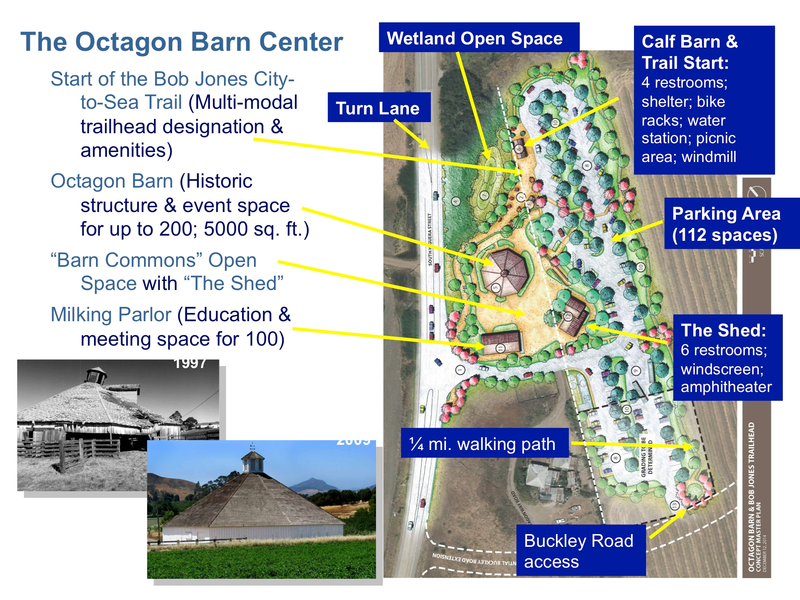 The Octagon Barn Center will be a multi-use community asset that provides for local private and public events, and a place for generations of local residents, school groups, and area visitors to learn about the importance of agriculture in San Luis Obispo County. Click the link to view the Project Plans and Renderings (please note that these are not the final plans). At this time, the Octagon Barn is not open for public events such as weddings or private parties. If you would like to be on a waiting list for the future, please contact us. Construction has started at the Octagon Barn Center, and we are anticipating an opening date in 2019. Chris Helenius (Board President), Kaila Dettman (Executive Director), and B.K. Richard (Board Trustee and Octagon Barn Center Project Manager) break ground for construction of the pump house and water system. 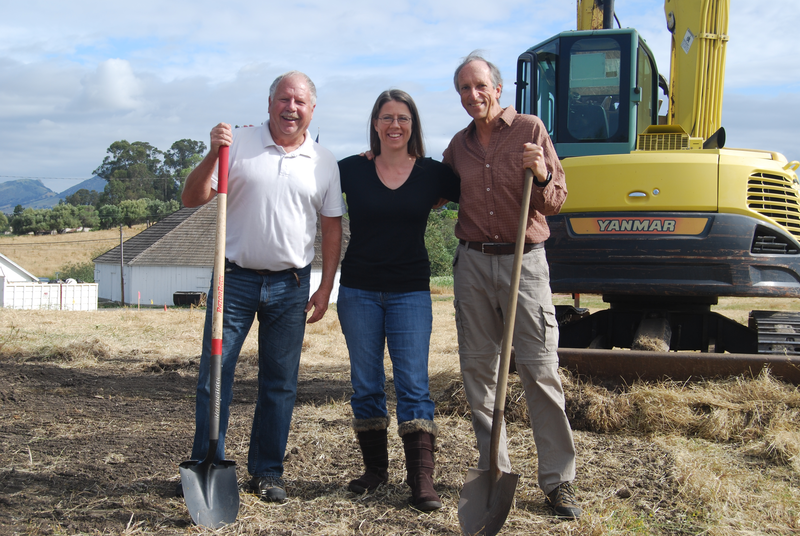 In 1997, while The Land Conservancy was working with the Hayashi Family to plant trees along San Luis Obispo Creek, the nearby Octagon Barn was a vacant shell of its historic past. The crumbling structure known by area residents and visitors for over 100 years was on its last legs. The Land Conservancy’s Executive Director at the time, Ray Belknap, approached the Hayashi Family with the idea of restoring the old barn. Ray recognized the rarity of the architecture, the symbolism- tying it to an agricultural landscape, and its potential for new life. In 1998, The Land Conservancy leased the Octagon Barn and began the huge undertaking of its restoration. Read more. Thank you to all our community donors and partners who have supported this project in the past and who still continue to do so. A special thank you to B.K. Richard, Land Conservancy Board Trustee, who voluntarily serves as the Octagon Barn Project Coordinator. This project would not be possible without all of you!